Suppose a man hasn’t shaved in a very long time. He decides to get rid of his facial hair, so he digs out his old electric shaver. This is the only shaving tool he has, and it is not in good shape. Still, it starts when he plugs it in. So he goes to work. Even though the shaver is clearly damaged and his whiskers are very long, it’s getting the job done. He shaves his face first. 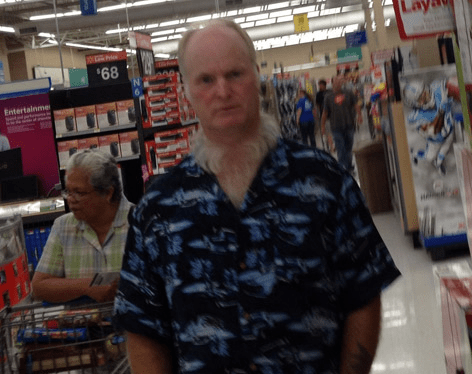 Then he shaves the top of his neck. Then he shaves a path down the middle of his throat. Then it breaks. There’s no fixing it, and there’s no one else in the house he can ask to go buy him a replacement. He goers to the store himself. In the olden days, this would have been a potential embarrassment, if by some chance he had seen someone he knew. Still, it would have been between him and that person. The most the person could have done to make it worse was to describe it to other people, and the description would be less likely to call a visual image to mind than to raise the question of what happened. The answer to that question would dissipate the embarrassment pretty quickly. I don’t know who this guy is, and have no idea how he came to look like that. But the story above is the only explanation I can think of that doesn’t involve a lifestyle commitment to Seussical the Musical. And it makes me glad that I shave my neck first. Indeed, I sometimes think of the adage “If there is a point in a task when interruption will result in disaster, assume that you will be interrupted at that point” as Neckbeard’s Law. I’ve searched for this adage online, but have so far found nothing. There are a number of books with “Murphy’s Law” in their titles; perhaps one of those books would have a form of it. And I find that there is a field called “Interruption Science” which consists entirely of studies about what happens when people are interrupted during tasks. So if I wanted to christen it “Acilius’ Law” and gain worldwide fame, I’d start by looking in journals that publish research in Interruption Science and, if I couldn’t find any article there in which the adage was already named for someone else, proceed on to those Murphy’s Law collections.